A call to David Legrand at Fraser Yachts brings confirmation that his central listing, the 30.75m motor yacht Leonardo has had a major price cut of €1.2 million. 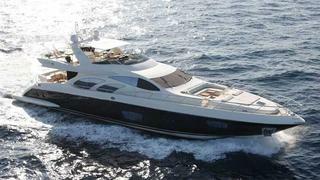 Leonardo was delivered by the Azimut yard in 2007 with naval architecture by Stefano Righini. A spacious interior from designer Carlo Galeazzi accommodates up to 10 guests in a master, VIP and two twin staterooms plus two Pullman berths, while this superyacht's twin 2200hp MTU engines deliver a cruising speed of 28 knots and a range of 400 nautical miles at 24 knots. The new asking price is €3.2 million.